The Royal Canadian Mint’s fifth $100 for $100 silver coin is at 82% of maximum sales. Depicting a galloping horse and sold at its legal tender face value of $100, or about US $79.71, this coin has a mintage limit of 45,000. This mintage level matches the last release featuring a Bighorn Sheep and is 5,000 less than the first three in the $100 for $100 series which depicted a Bald Eagle, Grizzly and Bison. All past issues sold out. Struck in 99.99% pure silver to matte proof quality, each 2015 $100 Canadian Horse Silver Coin has a weight of 31.83 grams, a diameter of 40 mm and a serrated edge. With today’s London silver Fix price of $15.78 an ounce, these silver coins have a silver melt value of about that amount. Like the past four coins, the reverse or tails side was designed by Claudio D’Angelo. Around the horse which is seen running along a Canadian landscape are inscriptions reading: ‘CANADA’, the year 2015, the coin’s face value of ‘100 DOLLARS’ and the D’Angelo’s initials of ‘CD’. Obverses or heads side have Susan Blunt’s portrait of the Queen. Encircling inscriptions include ‘ELIZABETH II’ and ‘D.G. REGINA’. Found on the coin’s product page are 41 reviews. They give the silver coin a rating of 4.5 stars out of 5. Top pro ratings note that the coin is attractive (33), a good value (28) and of great quality (26). Four listed cons note that the coin is "too small." 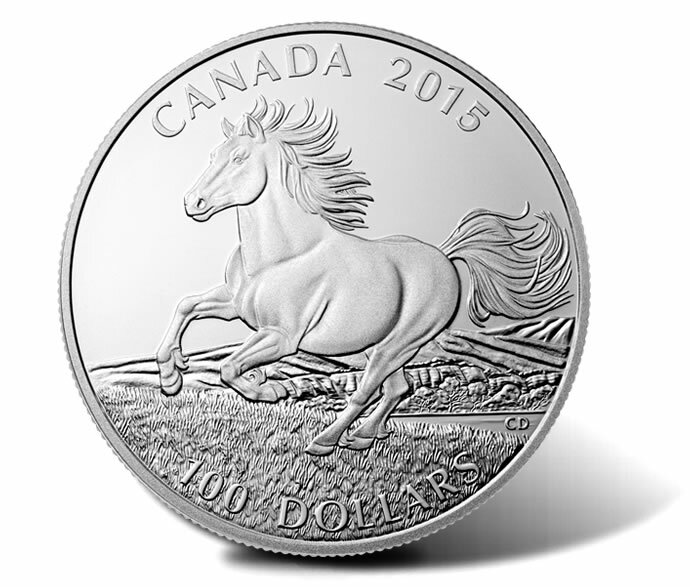 2015 $100 Canadian Horse Silver Coins are available from the Royal Canadian Mint website at mint.ca. The following affiliate link goes directly to the RCM’s $100 for $100 page . A subscription option is also available. Subscribers automatically receive the second 2015-dated $100 coin when it launches in July 2015. That coin’s design has not been announced.